We are fully equipped and experienced to service and install a diverse array of pumps for pond or river-fed irrigation systems. 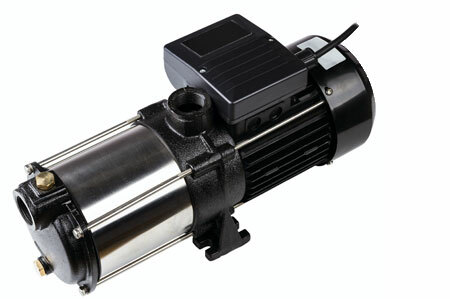 The Rain Man services many centrifugal and submersible pumps. Our pump sizes range from a standard ¾ HP pump, for an average residential irrigation system, up to a 15 HP pump, typically used for very large irrigation systems such as golf courses. Recently we have had great success with Pentaire and Mono Subdrive systems. These systems allow pumps to run specifically to gallonage needed at any time without wasting power and extra wear on the pump. Installing a submersible pump is definitely a cost effective way to provide water for your irrigation system, especially when it comes to the spring start up and fall winterization. Centrifugal pumps need to be winterized, unlike submersible pumps which remain in water all winter. Submersible pumps work on demand, providing as much water as needed, with the irrigation controller. We use Hunter pump start relays, as well as pressure tanks which allow water on demand for hose bibs throughout your property. Having a pond fountain as part of your irrigation is very popular and beautiful water feature. Fountains can be on an independent zone on your controller or designed to run continuously, except for when sprinklers are operating.